Dried cherries are a tasty, portable, and healthy snack on their own. They can also be used in baked goods, as a salad topping, and in compotes. Wash the cherries and let them drain in a colander for a few minutes. Remove and discard the stems. Cherry Pitter: These are inexpensive gadgets that can also be used to pit olives. The Beer Bottle Pitter: All you need is a beer or wine bottle, cherries, and a chopstick. Place a cherry, stem end up (but with the stem already removed), on the opening of the bottle. Punch it with the chopstick. The pit will fall into the bottle while the rest of the cherry remains where it was. The Drinking Straw Pitter: Hold a cherry between your thumb and forefinger with the stem end facing up (stem already removed). Punch out the pit with a plastic drinking straw. The pit will go into the straw. Repeat with more cherries until the straw has filled with pits. Cut the pitted cherries in half. Place them cut side up on baking sheets. Be sure that none of the cherry halves are touching; you want air to be able to circulate around each piece of fruit. Place the sheets of cherries in a 150 F/65 C oven. If your oven does not go this low, prop the door open with the handle of a wooden spoon. The cherries should be dry in about 10 hours. They should feel totally dry to the touch but still be leathery and somewhat pliable. Don't be tempted to raise the oven temperature to speed the process, as you want to dehydrate the cherries, not cook them. You won't be completely sure if the cherries are fully dehydrated until they have cooled. Turn off the dehydrator and open it. Let the cherries cool on the trays for 20 to 30 minutes. After the cooling off period, break one of the cherries in half. There should be no visible moisture along the surface of the break. Even after the cherries are correctly dehydrated, there may still be some residual moisture in the fruit that you can't feel. This shouldn't be enough to prevent the fruit from being safely preserved and mold-free. But you'll have a tastier, better product if you do what is called "conditioning" the dried fruit. Put the dried, cooled cherries into glass jars, only filling the jars about 2/3 full. Cover the jars. Shake the jars a couple of times a day for one week. 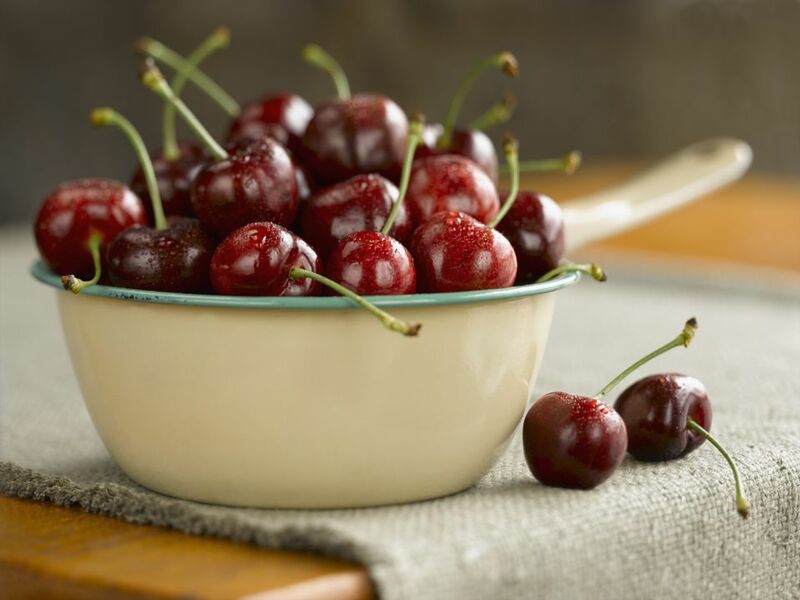 This redistributes the cherries as well as any moisture they may still contain. If any condensation shows up on the sides of the jars, your fruit isn't dried well enough yet and it needs to go back into the dehydrator for a few hours. Once your dried cherries are conditioned, store them in airtight containers away from direct light or heat. It's okay to fully fill the jars at this point; the 2/3 full was just for the conditioning phase when you needed to be able to shake the pieces around.